I finished the Roubo/Holtzapffel-hybrid bench inspired by Chris Schwarz’s book this past weekend. The bench is made from southern yellow pine and a collection of other wood types from off-cuts, etc. The front vise jaws, 2″ plane stop, and deadman are mahogany, the shelf dowels are walnut, the end vise jaws are maple, the left-end plane stop is oak, etc…whatever I could scrounge up for each step. This bench is designed to be USED, so I was not worried about matching. 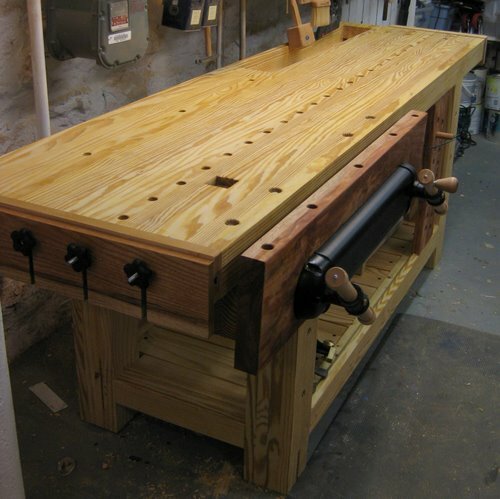 It is basically the French Roubo-style bench that I modified by adding the sliding deadman, a Veritas twin-screw vise (24″ between centers, 42″ overall) and a 1/2 length tool tray. The end-vise is a Groz metal vise. I cut the slot into the bottom of the front, left leg in case I ever want to switch to a leg vise. 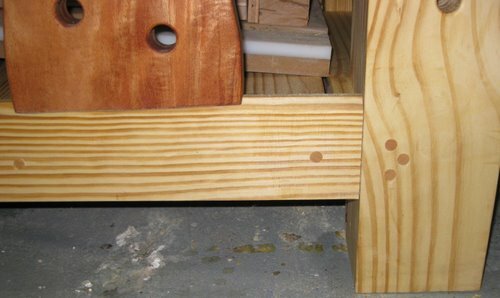 I drilled dog-holes into the bottom shelf for storage of dog devices under the bench (see below the front vise). Notice the Chris Schwarz designed plane stop on this end of the bench. 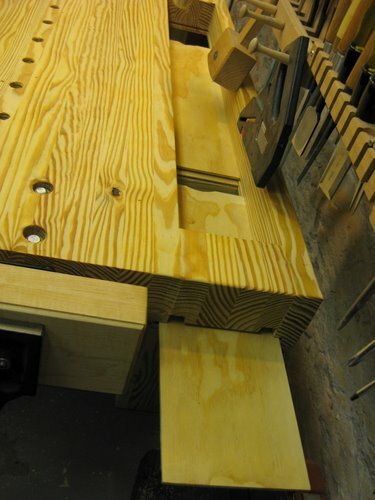 Loosen the screws and raise the plane-stop board to the desired height. 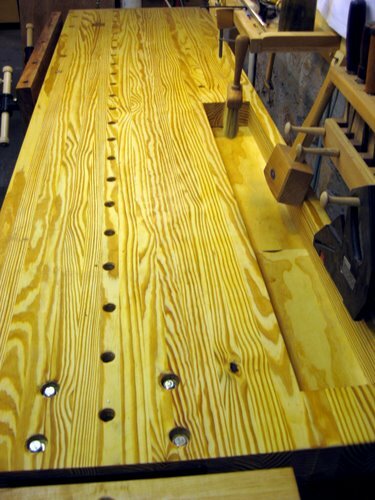 The screws ride is a T-track mounted in to the end of the bench top. Above is the metal end-vise. Notice the tool tray slots to the right. The bottom of the tool tray slides out this side for cleaning. Better view of the tool tray. Both vises are through-bolted for strength. Those are the bolts in the bottom left. Note the only knot that I did not manage to bury in the bench top somewhere, visible next to the bolts. This is how the tool tray bottoms (two pieces) slide out for cleaning. They can be completely removed. The bench is finished with two coats of Danish Oil that will be renewed as needed. All joints are doweled together for extra strength (some are draw-bored and some are not). I really like the 2″-square plane stop block insert into the bench top above. It can be moved up and down as needed. It is held in place by friction alone. Posted on October 6, 2008, in Tools and Shop. Bookmark the permalink. 3 Comments. Congratulations. A big project done and done well. Have you had a chance to put it through its paces in the last two weeks? I love the bench so far. I haven’t found anything to change yet. 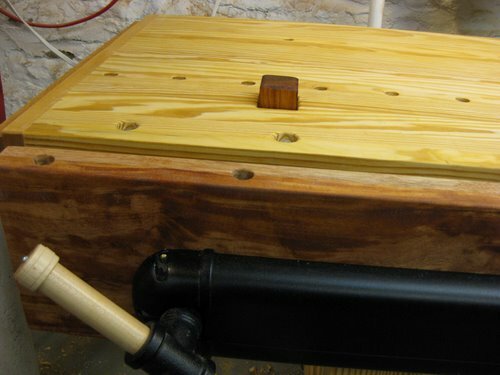 It is rock solid and I like the twin screw vise and other work holding items. I’ll let you know if I find anything that I want to change as I work more with the bench. 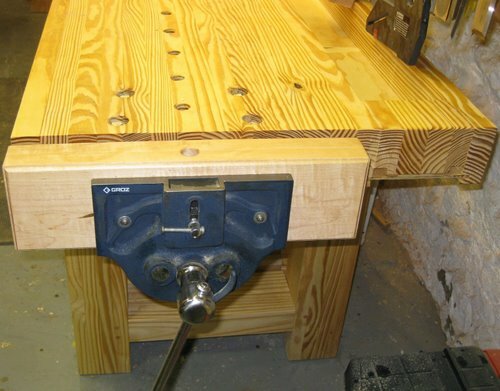 Great workbench. Also, nice tool tray slash waste area. Friction-only 2″ stop.. good idea!